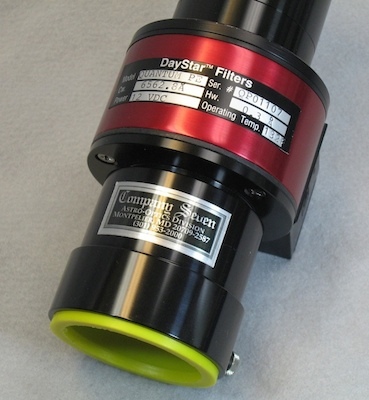 DayStar is best known in the amateur astronomy community for their Hydrogen Alpha filters however, they also manufacture other specialized and custom filters that are uniquely designed to transmit a narrow portion of the solar spectrum while reflecting or absorbing undesired parasitic light. To accomplish this, white light (which is produced by a combination of colors) must be broken down into its constituent form to produce a rainbow of colors. Each color is measured in units "Angstrom" which represent 1x10-10 meters; this is often represented by the symbol "Å". The human eye can discerns colors within the rainbow from 3800Å in the violet, up through about 7000Å in the crimson. Within Sun light the continuous spectrum visible in white light is interrupted by a series of black bands called absorption lines. 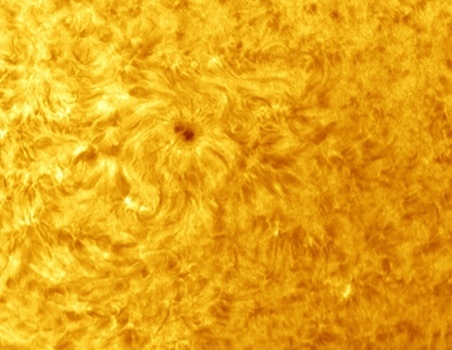 These lines are primarily created by cool absorbing gases located in the upper photosphere or chromosphere of the Sun and in order to observe phenomena interacting with hydrogen or calcium, very precise optical filtration is required. Bandpass regulation, and controllability features of the filter. For those new to this area of astronomy, these filters are categorized first by their bandpass (transmission) wavelength. These letters and numbers have to do with some particular slice of the light from the Sun that is to be examined. To understand the wavelengths of interest better we start off here with a bit of history, you can read more elsewhere but we provide just a primer here. The major Fraunhofer lines, and the elements they are associated with that are of interest to the observer of the Sun, are shown in the table below at left. In 1802 the English chemist William Hyde Wollaston was the first person to note and publish reports mentioning the appearance various dark features in the solar spectrum. By 1814 the German scientist and optician Joseph Fraunhofer independently rediscovered the lines and he commenced a systematic study involving careful measurement of the wavelength of these features. These are emission lines that appear in the spectra of heated elements, but that was not understood until others noticed the correlations between Fraunhofer lines and the emission line. Fraunhofer ultimately identified several hundred more lines, and designated the principal features with the letters A through K, with the weaker lines bearing other letters. Since then many thousands more lines of sunlight have been identified. Some decades after Fraunhofer it was correctly deduced by others that dark lines in the solar spectrum are caused by absorption by chemical elements present in the solar atmosphere. The monochromator filtration technology must successfully isolate and transmit a prominent absorption line from the rest of the spectrum. So in the DayStar filter the Sun light passes through a telescope then into the filter body where it is progressively filtered through series of up to twelve optical elements and synthetic spacing media: each is a critical component. The elements include an anti reflection coated optically flat window, narrow band blocking filter, an etalon window, a Fabry-Perot solid space crystal (carefully produced in house by DayStar), a second etalon window, broad band trimming filter, and another anti reflection coated optically flat window. Delivering high purity of filtration for solar observing involves new and innovative thin film coating technology. To fill this need, DayStar has developed a laser assist coating process under computerized control. This and other filtration improvements over the recent decades has made it possible to present higher quality durable components to meet the increasing needs of our customers. The housing of each filter is furnished with the appropriate mounting hardware and flanges to attach the filter onto a telescope. Optional hardware may be needed to accept visual or imaging (film, video, or integrating CCD systems) accessories or measuring instruments. Company Seven offers a good selection of hardware with the expertise to recommend what may be appropriate for your needs. 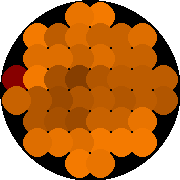 Above: DayStar Filter bodies are color coded for ease of identification. All are powered based on either the QUANTUM and ION series housings. At the rear are: QUANTUM series Hydrogen Alpha filters (red), then Helium D3 Line, and Calcium K Line filters. Most are shown with attachment interface plates. At front are formerly available T-Scanner series tiltable filters including: Hydrogen Alpha, Sodium D Line and Calcium H Line (85,285 bytes). 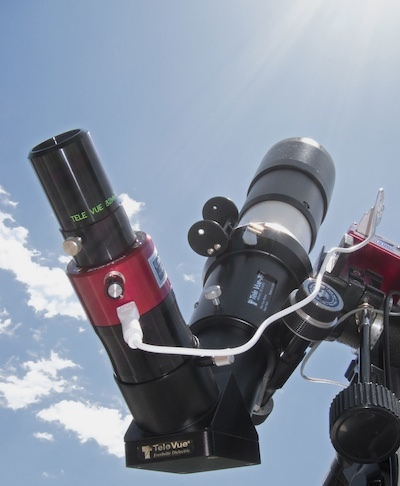 Quickly move a DayStar filter from one telescope to another. This allows you to change from a smaller aperture and more handy telescope for casual observing up to a larger or even observatory class telescope as the local seeing conditions allow, all without having to buy the Hydrogen Alpha filter all over again. 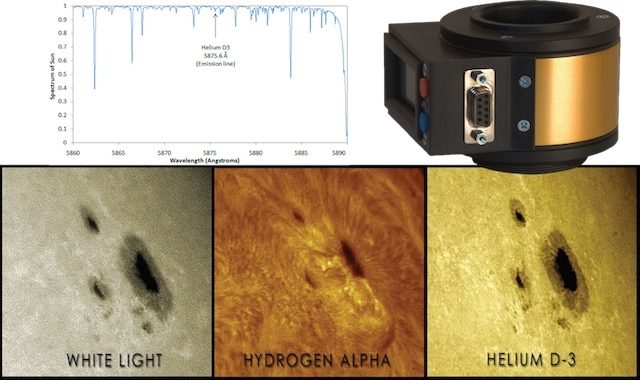 Quickly exchange one DayStar Hydrogen Alpha filter for another on the same telescope to observe the different features of the Sun over a greater range of bandwidths than any other filtered telescopes in production. You can observe extended prominences and large surface details with a broader bandpass filter (0.7 or 0.9 Ångström), then change over to a narrower bandpass filter (0.5Å or even down to 0.3 Å) to see or image surface structures more clearly. All of this can be accomplished with the same telescope. Quickly exchange one DayStar filter for an entirely different wavelength filter to see features that were not even hinted at with the first filter. You can observe extended prominences and large surface details with a Hydrogen Alpha filter, then change over to a Calcium II K-Line filter or Helium D3 Line filter for example, again all of this on the same telescope. For convenience or remote control changes from one type of filter to another quickly, then Company Seven can integrate numerous filters into the DayStar Solar Filter Wheel! Operate the temperature regulated DayStar filters models on band regardless of ambient temperature, and anywhere in the world from a 12 volt battery or AC to DC Power Supply. We at Company Seven have decided to equip our facility to study the Sun with our Astro-Physics and our TeleVue refracting telescopes of up to 206mm aperture! Although for reasons of convenience and because of the typical limits imposed by our local "seeing" conditions, we routinely employ telescopes of only between 80mm to 130mm. Though depending on your requirements and local seeing conditions, you may employ smaller or much larger, even meter class telescopes. We invite you to contact Company Seven to learn more about these systems, or visit our showroom to see the DayStar filters in operation. The photosphere is the visible surface of the Sun that amateur astronomers are most familiar with. this is readily observed with relatively inexpensive solar filters such as that we offer by Questar, and Baader Planetarium for example. The visible surface of the Sun is not a solid surface but is actually a layer of the gas ball that is about 100 km thick; this is relatively thin compared to the 700,000 km radius of the Sun. When observing the center of the disk of the Sun we look straight in and see somewhat hotter and brighter regions. When one observes the limb of the solar disk that light has taken a slanting path through this layer and we only see through the upper, cooler and dimmer regions. This explains the "limb darkening" that appears as a darkening of the solar disk near the limb. A number of features can be observed in the photosphere with a simple telescope equipped with a suitable "White Light" filter with a metal coated glass or polymer element, designed to reduce the intensity of the Sun light to comfortable levels, and to eliminate or attenuate harmful portions of the spectrum. 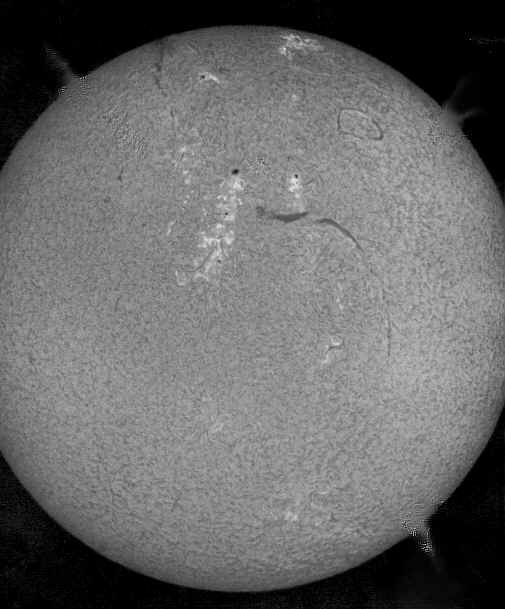 Left: The Sun as it may appear through a White Light Filter (32,724 bytes). Depending on the nature of the coating or metal used to make the filter the Sun may appear white, blue, yellow (as shown at left), or orange red. 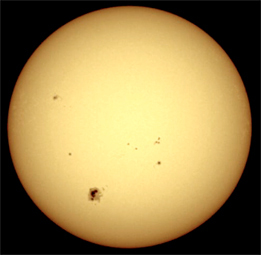 The features visible in a white light filter may include: 1. dark sunspots, 2. the bright faculae, and 3. granules. One can also measure the flow of material in the photosphere using the Doppler effect. These measurements reveal additional features such as supergranules as well as large scale flows and a pattern of waves and oscillations. 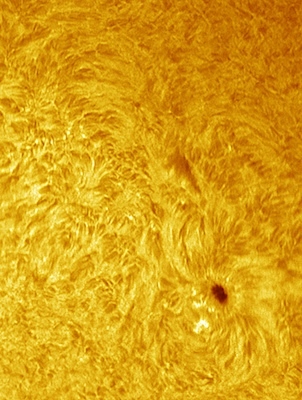 The chromosphere appears as "peach fuzz" surrounding the Sun; this is an irregular layer above the Sun's photosphere where the temperature rises rapidly from 6000°C to about 20,000°C. At these higher temperatures the hydrogen emits light that gives off a deep red color (H-alpha emission, often abbreviated as HÅ). The chromosphere derives its name (color-sphere) from this phenomena. This colorful emission can also be seen in prominences that erupt and then project to beyond the limb of the Sun into the blackness of space. Prominences may be safely observed by the naked eye during total solar eclipses. 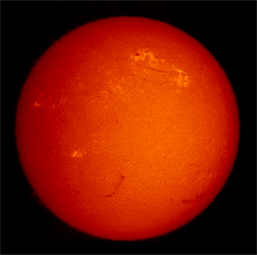 Left: The Sun as it may appear through a Daystar Hydrogen Alpha Filter (37,053 bytes). 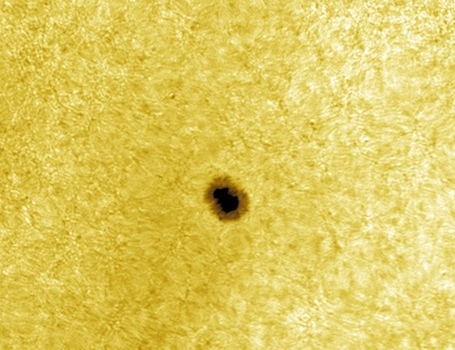 However, when the Sun is studied through a spectrograph or a filter that is engineered to isolate the H-alpha emission, then many more features are revealed including: the chromospheric network of magnetic field elements, bright plage around sunspots, dark filaments across the disk, and prominences beyond the limb. The most commonly used portion of the spectrum for serious studies of the Sun work is in the red portion of the solar spectrum, at the line of Hydrogen Alpha (sometimes written as Hydrogen-α) located at 6562.81Å. At its half intensity point, this line is only 1.20Å wide. A 0.5Å bandpass filter is passing only about 1/8000 of the frequency band of visible light! Providing optical filtration in this order of dimension is most demanding, and DayStar is among the few who have been able to do this consistently, and with good durability and longevity of the filter system. Our DayStar Hydrogen Alpha filter product line currently consists of three series of filters which obviously will differ one from another by modes of tuning, by bandpass, and by spectral uniformity. In making a filter selection, one should focus on technical considerations including the desired performance requirements in terms of spectral uniformity, and filter bandpass*1. *1 The segment of the solar spectrum transmitted. Hydrogen Alpha Filter Bandpass: for all of these filters , the more pure (or narrower) the filter bandpass is then the higher will appear the contrast of solar disc features. In fabricating the filter components the most difficult parameter to control is spectral uniformity which is governed by the quality of the etalon*2; this sets the limit of the bandpass. Spectrally, the filter must be able to deliver a tightly controlled sub-angstrom bandpass over the working aperture. In spite of the many advances in fabricating technology, the experience at DayStar is finding that producing a spectrally uniform etalon seems more like an art than an exact science. *2 An extremely flat and parallel crystalline substrate. 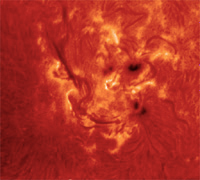 All DayStar Hydrogen Alpha filters provide clear and exciting images of prominence and surface phenomena, to see these and read an explanation of them refer to DayStar DayStar Bandpass Filters: An Introduction To What They Show And Why in our DayStar Library section. 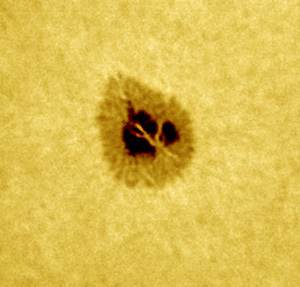 Observers concentrating on prominence work generally prefer a wider bandpass, (0.95 to 0.80Å). Those concentrating on subtle surface detail require higher contrast or ultra-narrow bandpass filter systems, (0.70 to 0.50Å); the most common fabrication request from the amateur who is venturing into this area for the first time is 0.60Å for example. So basically speaking, the narrower the bandpass is then the more striking will be surface features but with some loss in the ability to observe large prominences particularly as they extend and cool farther and farther away from the Sun. The wider the bandpass is then the finer surface will be less apparent even though Sunspots remain visible, but the larger prominences and Coronal Mass Ejections that extend far off the limb of the Sun are more apparent. Energy Rejection Prefilter: the DayStar Hydrogen Alpha solar filters are engineered to function with an optional energy reduction "pre filter" attached onto the front of almost any telescope. This can be employed with or without an aperture stop. While the cylindrical housing of the filter body is installed onto the focuser of the telescope. This is an optional precisely made glass filter element housed in a machined aluminum cell that is attached over the objective of a telescope, well ahead of the Hydrogen Alpha filter assembly. It's primary function is to reduce the intensity of portions of the solar spectrum which could otherwise result in damage to the Hydrogen Alpha filter elements. This component may be calculated to shape the beam of light towards a nominal focal ratio by reducing aperture of the telescope for example. So the Prefilter element may be made to cover the entire front opening of the telescope, this being referred to as a full aperture configuration. Or the Prefilter cell can be made to cover the perimeter of the telescope objective holding a smaller diameter filter glass to suit the requirements of the optical arrangement. The Prefilter can be made as an off-axis arrangement (for obstructed telescopes) or centered on-axis for use on unobstructed telescopes, refractors for example. One or more aperture stops can be used stop down the Prefilter to suit seeing conditions, or reduce the brightness of the image to suit camera limitations or for some special effect. Right: precision Prefilter manufactured by Company Seven for use with a DayStar Hydrogen Alpha filter. At left it is shown hand held, and at right installed (111,301 bytes). The proper design involving selection of the Prefilter aperture, proper qualities of the filter glass element in terms of raw material homogeneity and freedom from striae, and excellence of manufacturing (flatness and smoothness of surfaces and parallelism of the two optical flat surfaces) are essential to the proper operation of any DayStar Hydrogen Alpha filter. Operation of a DayStar hydrogen alpha filter without this component is not practical and will void the warranty. For a complete review of the system components, and how they function then read the instruction manual that was written by Company Seven and that is provided by us with each controller that is sold by us. 1. The QUANTUM PE series filtering systems represent the finest components manufactured by DayStar, and are made available for Hydrogen Alpha, Sodium (Na) D, Calcium (Ca) II K-Line, Helium, and custom wavelengths by request. The QUANTUM PE represents the best performance DayStar can deliver, while the QUANTUM Series are also about ease of operation.... total simplicity. Professional institutions and the more advanced observers that employ research quality optical systems are encouraged to consider the filtering power of these top quality products. Photos cannot convey the 3-D like qualities of the Sun surface details when observed through this filter and a suitable telescope: simply stunning! Click on image to see enlarged view (172,896 bytes). The QUANTUM PE are Professional Edition instruments that deliver full aperture spectral uniformity of the full aperture wavelength per filter zone tested; these are tested at the mean peak wavelength in overlapping zones. So our PE series are recommended whenever precision homogeneity and highly uniform on band transmittance values across the entire substrate surface are required. PE grade filters are manufactured and qualified to a spectral uniformity in CWL (Central Wavelength) accuracy of ±0.05 Ångström *. Daystar QUANTUM filters undergo high resolution spectrographic scanning. This new, specially engineered spectroscopic testing equipment provides high resolution mapping of all new DayStar Filters. All air to glass surfaces are antireflection coated with state of the art V-coatings to reduce losses of light per surface to 0.2 percent at their designed wavelength; so higher throughput and less risk of ghosting are attained. The QUANTUM PE precision systems are extremely difficult to produce, requiring additional quality control steps and additional fabrication and testing time so please plan for some extra time in the delivery schedule. The high resolution etalon mapping equipment at our factory offers qualification certified accurate by independent testing with etalon transmission sample sizes of 5mm, 2mm or 1mm sample sizes and with certification printouts available on new PE filter purchases. * The mean peak wavelength of all 12 mm diameter areas shall be within ±0.05 Ångström of the full aperture wavelength measurement. QUANTUM PE filter typical uniformity (2,430 bytes). 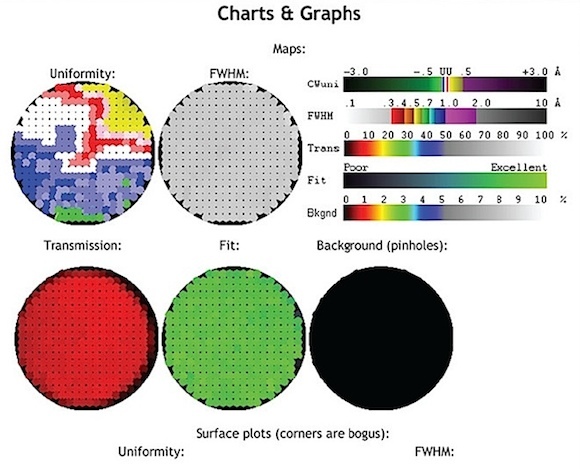 of transmission across the area of the filter, and its full width at half maximum (FWHM), and checks for pinholes. Click on image to see enlarged view (134,280 bytes). 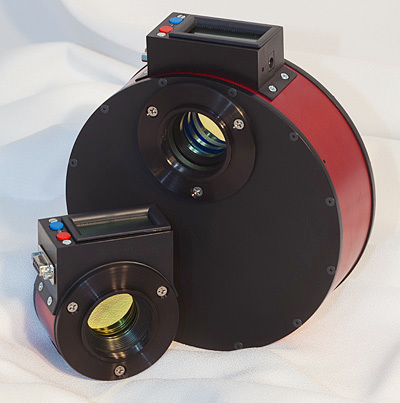 The QUANTUM PE series Hydrogen-Alpha filters are compatible with most focal length systems providing a nearly parallel nominal f/30 beam whether by design of the lens/telescope or through intermediary components including Telecentric, negative, and other beam-shaping auxiliary optics provided by Company Seven. These Hydrogen-Alpha filters are available with a bandpass as wide as 0.80Å or as narrow as 0.3Å through a clear aperture of 32mm. The resulting visual observations, images and traditional filtergrams are simply stunning. In that all interference filtering devices are sensitive to ambient temperature changes, the DayStar QUANTUM series filters housings are engineered to maintain on band performance across a wide range of temperatures - even at conditions that a human will not tolerate for long. The filtering elements are housed within a compact cylindrical, digitally controlled temperature regulated oven. By controlling the current flow to the oven element models can be calibrated with settings provided with each new filter produced. The bandpass can be regulated locally by pushing the red or blue buttons, this adjusts the oven settings to precisely tune the wavelength up or down; this can also facilitate Doppler studies for example. The QUANTUM filter bandpass is maintained by the digital controller and that bandpass is indicated on the Liquid Crystal Display (LCD) panel; the housing offers live LCD readout of the filter's wavelength output accurate to 0.1Å. To facilitate use not only in an observatory setting but also in the field, the oven is powered by 12 volt DC current, drawing as much as 3.5 amps depending on the ambient temperature. The integral Serial Com Port (female DIN-9 connector) provides the capability for remote control of the filter and with on-screen display of filter readout by a personal computer using the free DayStar Quantum Control software. This Windows® PC based application, also useable on an Apple Macintosh running a Windows® OS, allows the user to communicate from a Serial Port (or USB Port with Serial Converter) to the filter. Quantum Control is intended as an educational tool, as a way to control up to four (4) QUANTUM filters remotely, and to provide more control than is possible with the filter's limited hardware user interface. The software provided graphical feedback of the filter status displaying in Ångstroms or Nanometers, and allows the operator to control the filter, maintain a bandpass log, and more. This ability to vary the current also permits those models with calibrated off-band tuning and signal optimization to shift the passband by 1.0Å per 16.8 degrees F; therefore, increase the temperature for long side shifts, decrease for short side shift. And by varying the etalon temperature the observer is able to optimize contrast and engage in Doppler studies. While the unit operates at 12VDC for field or battery use, also included with each QUANTUM PE is a 100-240 power supply with US, European, UK and Australian adapter wall plates. Customers who own the older DayStar University or ATM series filters can have the filter elements removed, serviced, and then installed into the newer QUANTUM PR or SE series housings. This too guarantees they will continue to enjoy the benefits of longevity and adaptability that only the DayStar trade name can provide. at 6562.3Å, in service at Company Seven (88,562 bytes). - yeah, that's $28,000 sitting there (86,674 bytes). 2. The QUANTUM SE series filtering systems provide wonderful imaging fidelity regardless of most ambient temperatures, but at a more affordable cost than the PE series. Smooth spectral uniformity is provided by instrument quality etalons; these will satisfy the needs of most observers and casual imagers too. Informative filtergrams can be made with slight dodging in the darkroom or on the computer. Nominal at f/30 (full aperture or stopped down) with optical systems delivering an effective focal length of up to 2000mm, the user will find the spectral uniformity of these filters impressive. The QUANTUM SE series are available in a bandpass range of from 0.95Å to 0.50Å. As with the PE series, these SE filters incorporate digitally controlled regulation circuitry, and a Serial Comm port. If the main stay of the observing program concentrates on filtergrams and CCD imaging, then we suggest you consider the advantages of the PE series. If the main desire is for visual work and taking basic filtergrams, then the QUANTUM SE is an excellent choice. We are constantly amazed by images delivered by these systems and continually receive quality filtergrams taken by SE owners that give the "big boys" a run for their money. As mentioned above, the DayStar QUANTUM series filters are designed to maintain on band performance across a wide range of temperatures. The filtering elements are housed within a compact cylindrical digitally controlled temperature regulated oven. During the course of manufacturing a filtering unit, each is thermally tuned by a precision factory-calibrated oven to maintain proper bandpass tuning. To facilitate use not only in an observatory setting but also in the field, the oven is powered by 12 volt DC current, drawing as much as 3.5 amps depending on the ambient temperature. Right: DayStar Quantum SE 0.5Å filter coming up to temperature as displayed on an optional PC with DayStar Quantum Control software (55,879 bytes). The filter bandpass is maintained by the digital controller, and that bandpass is indicated on the Liquid Crystal Display (LCD) panel. The housing offers live LCD readout of the filter's wavelength output and is accurate to 0.1Å. This can be regulated locally by pushing the red or blue buttons to precisely tune the wavelength up or down for Doppler studies. The Serial Com Port (DIN-9) provides the capability for remote control with on-screen display of filter readout by a personal computer. By controlling the current flow to the oven element models can be calibrated with settings provided with each new filter produced. This ability to vary the current also permits those models with calibrated off-band tuning and signal optimization to shift the passband by 1.0Å per 16.8 degrees F; therefore, increase the temperature for long side shifts, decrease for short side shift. And by varying the etalon temperature the observer is able to optimize contrast and engage in Doppler studies. While the unit operates at 12VDC for field or battery use, also included with each QUANTUM PE is a 100-240 power supply with US, European, UK and Australian adapter wall plates. Owners of the QUANTUM SE series filters can return their filter to us for an upgrade, so over time we can reconfigure your QUANTUM to operate at a narrower bandpass for example and do so at a lower cost than that to buy a complete new QUANTUM series filter. Customers who own the older DayStar University or ATM series filters can have the filter elements removed, serviced, and then installed into the newer QUANTUM PR or SE series housings. This too guarantees they will continue to enjoy the benefits of longevity and adaptability that only the DayStar trade name can provide. 3. The ION series filter assemblies are designed for amateur observers who desire on-band performance regardless of ambient temperatures, but that are easy to own and easy to operate. These filters are intended for visual or casual imaging work, and are available in a 0.80Å to 0.50Å bandpass. Think of the ION as a mix between our QUANTUM and our T-scanner configurations, with the ION allowing tuning control with its thermo electric cooling (or heating) in any climate but without the digital display or Serial Comm port of the QUANTUM filters. The ION filters too operate from 12 volt DC power sources, they include a 6 foot long cord with a 6 foot extension and international (120 to 200 volt AC) power supply with adapter plugs. Since the current draw is modest,users can power the filter off alternatives including portable rechargeable battery packs such as those we offer by Kendrick of Canada, or from portable solar power panels that Company Seven can provide too with or without battery backup on partly cloudy days. Because of the internal etalon arrangement these filters too operate in a nominal f/30 optical configuration. ION housings do not tilt the optics but instead employ a cylindrical housing housing with thermo-electric heating or cooling as desired. Vibration-free Mag Lev fans dissipate temperature quickly, but do not disturb your view though tests indicate they can slightly improve eyepiece stability. Lacking the digital display, the user tunes the filter for the desired effects by rotating the single-turn knob, this has a center position detent for wing shift adjustments of ±0.5Â in 0.1Â steps. As you adjust the dial you can observe the changes of appearance of the solar features. The 20mm clear aperture is narrower than that of the QUANTUM series, yet offers a non-vignetted view of the Sun on telescopes up to about 70mm of aperture. Larger telescopes than this can be employed with the ION however, they will just have reduced field of view. Because the ION incorporates a smaller etalon, this means owners can upgrade over time to narrower bandpass choices at a lower cost than that to upgrade the larger QUANTUM series filters. 4. As was explained to us and to visiting customers when Sean League visited Company Seven on 1 February 2014, the then forthcoming QUARK is the world's first production Hydrogen-Alpha Filter of its type. This is an unprecedentedly successful marriage of Hydrogen-Alpha filter* and beam-shaping optics that succeeds in being: Quick, Cheap, Easy and Fun to use. It is compatible with most telescopes or lenses of f/4 to f/9. 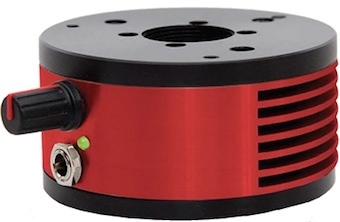 Just slip the lightweight QUARK assembly into the diagonal or focuser of your telescope, slide an eyepiece (or camera adapter) into the accessory holder, connect USB power, and you are off and running - and on-band year round! Simply remove QUARK from your focuser and your telescope is again ready for night-time astronomy or terrestrial pursuits. *The QUARK assembly is a product of DayStar Instruments incorporating DayStar Filters' Fabry Perot etalon technology. QUARK is a regulated Hydrogen-Alpha filter with a 25mm clear aperture. As with the ION series these are designed for amateur observers who desire on-band performance regardless of ambient temperatures. These filters are intended for visual or casual imaging work. QUARK is available in either a "prominence" configuration that will typically net a 0.6 to 0.70Å wide bandpass, or a "chromosphere" configuration that will typically net a 0.3 to 0.40Å wide bandpass; we state a range of bandpass since the final result will depend to some extent on the focal ratio of the telescope with which the filter is employed. Right: DayStar QUARK filter assembly with USB power cord (49,627 bytes). Click on image to see enlarged view (71,933 bytes). 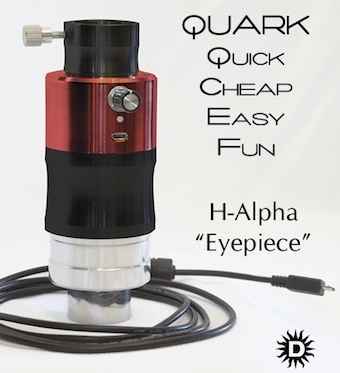 To keep setup quick and simple QUARK incorporates a custom Daystar 4.2X Telecentric Barlow Lens, this is fully optimized in terms of coatings and optical design specifically for applications in the Hydrogen-Alpha wavelength. This highly specialized lens arrangement eliminates back focus concerns, while also affording superior field flatness when used with the compact f/4 to f/9 focal ratio telescopes for which the QUARK is intended. Air-spaced optical elements are antireflection coated and optimized for transmission of the 656nm wavelength. Just remember that your compact telescope is now operating at an effective focal length of about 4.2 times its norm, so a 500mm telescope nets an image scale comparable to a telescope of 2,100mm focal length. 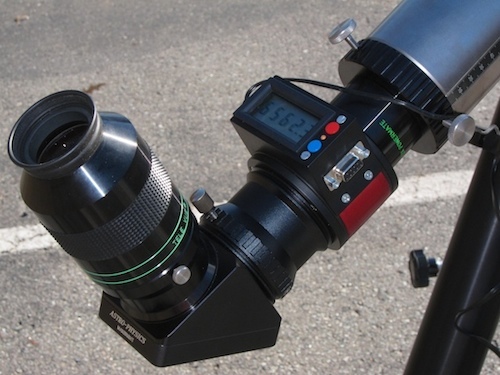 This makes QUARK and ideal accessory for compact telescopes such as our TeleVue 76 or TeleVue 85, or Astro Physics 90mm f/5 Stowaway or Astro Physics Traveler telescopes. Looking inside the QUARK (don't ask how Company Seven found out) reveals there are optical blocking components, that are separated from the rest of the assembly, which take the heat. Hence there is no problem using QUARK without an Energy Rejection Filter (ERF) with telescopes of 80mm aperture and smaller. We do recommend an optional UV-IR Cutoff Filter (available from Company Seven) for use with telescopes of greater than 80mm aperture, especially if you will be observing over several hours a day. This filter should be installed in line and ahead of any mirror or prism Diagonal. pathway with QUARK installed onto a 66mm aperture f/6 telescope, that nets a Field of View 0.6 Degrees wide (46,675 bytes). The QUARK filter is installed either onto the diagonal of a telescope or directly onto the focuser of a telescope, though using the filter without a diagonal may require the use of an optional extension tube in place of the diagonal to take up the backfocus distance. 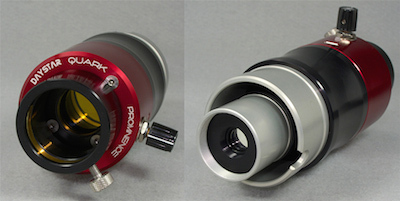 An eyepiece for viewing or camera for imaging, or an eyepiece with a camera (for 'afocal' techniques such as digiscoping or imaging through a cell phone camera) are attached to the QUARK filter. Power is supplied through the Micro USB connector, and you are ready to go! Left: DayStar QUARK filter as typically installed onto the diagonal of a compact telescope, here at Company Seven on our TeleVue 76 Apo telescope (64,732 bytes). The filter is shown powered from an optional portable solar charging battery pack. Also note also the TeleVue "Sol-Searcher" sight atop the TV 76 mounting collar. Click on image to see enlarged view (212,041 bytes). The filter nosepiece arrangement is set up similarly to that of the 2"/1.25" eyepieces pioneered by TeleVue and introduced with the original 13mm Nagler eyepiece. So the QUARK can slip right into any 2 inch or 1.25 inch eyepiece holder or diagonal, though either or both nosepieces may be removed. The smaller QUARK nosepiece is threaded for standard 1.25 inch diameter filters. The mechanics of the QUARK incorporate baffles that aid contrast. 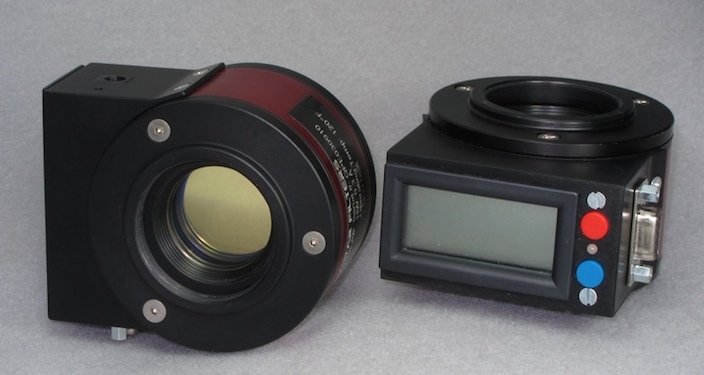 Right: QUARK Prominence model filter at Company Seven showing the eyepiece holder and Etalon at left, and the 2"/1.25" nosepiece arrangement (49,090 bytes). Click on image to see enlarged view (157,234 bytes). The compact design configuration eliminates unnecessary weight and associated costs. The fully optimized design eliminates the need for any optional adapters, Telecentric and/or Barlow lenses: all you need is combined into one lightweight eyepiece-sized device. For use with smaller aperture telescopes there is no need to attach a pre filter, that would be a mandatory optional accessory for use with other DayStar Hydrogen-Alpha filters. The arrangement of the QUARK is so compact and streamlined that at first glance it resembles an eyepiece and so some are calling this, in error, a 'filter eyepiece'. DayStar scaled the power consumption requirements so QUARK can operate all day from an optional DayStar palm-sized battery pack (shown above left), or from other rechargeable battery packs or even from Solar Panel power sources as Company Seven offers to our customers. QUARK is provided with a plug-in 90 to 220 volt AC to 5.5 volt DC 1.5 Amp Power Supply. The provided AC Power Supply includes a election of plug adapters for use overseas. You can refer to the addendum written by Company Seven for additional power sources advice and specifications. As soon as you connect a USB cable to the USB Micro power input port an LED provides a status report: red = insufficient power, yellow = warming up to nominal (allow ten to fifteen minutes), green = nominal temperature achieved. For best results you tune the filter by turning the dial (just above the LED indicator). Note Company Seven DOES NOT recommend powering this filter from a personal computer. 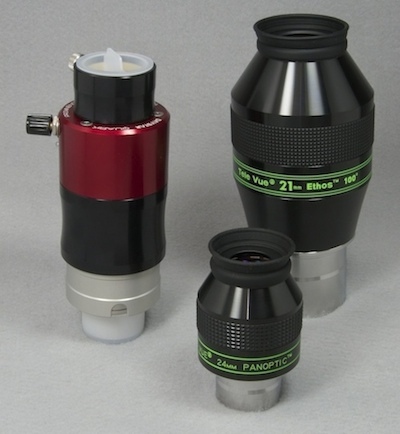 Left: QUARK filter shown for comparison alongside TeleVue's larger 1.25 and 2 inch diameter eyepieces at Company Seven (51,848 bytes). Click on image to see enlarged view (91,849 bytes). This new, All-In-One design marries high quality components into a compact and very portable assembly: Blocking Filter, Barlow (negative) Lens, Telecentric Lens, bandpass regulating housing, the Hydrogen-Alpha filter Etalon, and fittings to accept eyepieces or cameras. Through designed efficiency and optimization, you can enjoy the proven high quality of DayStar at an affordable price, and at home or around the world! Company Seven has been accepting orders for the QUARK since 1 February 2013, and was announced to the public on 1 April 2014. One of the first production 0.7Å QUARK filters will be on hand at Company Seven in May for use at our 'Solar Saturdays' observing sessions. Contact Company Seven, preferably by E-Mail to order yours or to learn more about this interesting and fun accessory. Designed to reveal information about the Sun's chromosphere by examining the light emitted by ionized Calcium (Ca II) at two strong absorption lines at 393.3nm and at 396.9nm, known as the K and H lines, these are in the deep blue region of the solar spectrum. Observation of the complicated structure of subordinate peaks offer views through different levels in the solar atmosphere. Researchers have previously avoided the H line for academic research as it is very close to the Hydrogen Epsilon line. For purposes of clarity in isolating Calcium and because imaging sensors offer similar sensitivity to the K as the H lines of Calcium, the K has to date been the target of choice in Calcium filters so DayStar Calcium K-Line filters are most often employed for academic studies in mapping the 3-dimensional structure of the Chromosphere. Our Calcium K-Line filters are centered at a band pass of 3933.7Å though by controlling wing shift of the Ca II K line filter with precision accurate to 0.1Å, studies can depict intensity differences between the K3, K2 and K1 lines. We also offer H-Line filters too. Some observatories have been imaging in Ca II H line, such as the Dutch Open Telescope with outstanding results. 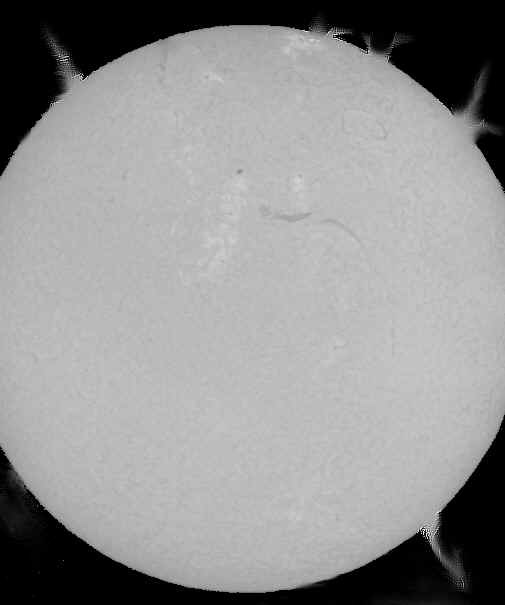 Left: Spectroheliogram of the Sun as shown through the DayStar 2.0Å Calcium K-Line Filter (60,382 bytes). 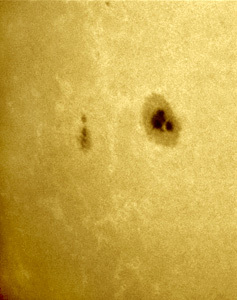 Observers equipped with a DayStar Calcium K-Line filter may view and image calcium plage excited by emerging, existing, or decaying sunspot groups. In Calcium K-Line, plage immersed solar active areas will appear across the entire solar disc, not just at the limb. Prominences too are commonly seen in the violet light of Calcium during solar active periods. Traditionally, university and government agencies sponsored research that has employed the Calcium K line for studies of Calcium on the Sun; these studies have been instrumental in determining depth of the solar atmosphere. 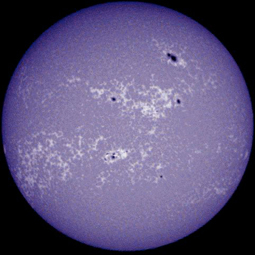 Above: DayStar Calcium II K-Line Filter body with comparison images taken by it, white light, and 0.4Å Hydrogen Alpha QUANTUM PE filter. Since we offer both Calcium II K-Line and Calcium II H-Line filters, we provide a spectrum graph indicating their points (148,876 bytes bytes). Right: DayStar 2.0Å Calcium K-Line filter coming to temperature as displayed on an optional PC with DayStar Quantum Control software (60,306 bytes). For visual use we offer the two cavity 8.0Å -10Å square band filter. The Calcium K-Line absorption band is about ten times as wide as the H-Alpha line, so filters having bandwidths of between 1 Å to 2 Å will provide informative filtergrams. For applications involving filtergrams and CCD imaging, we offer a single cavity QUANTUM 2.0Å or 5.0Å bandpass systems. These filter systems are designed for to be used with telescopes having f20 to f30 beams that transmit sufficient energy for a visual focus of the solar disk. Since the human eye's sensitivity is taxed at this end of the spectrum and routine exposure of the eye to these wavelengths is not a good idea, these filters are engineered for use with video, film, or CCD systems. Note: Calcium H and K-line filters systems operate with optical systems as fast as f/15, these do not require F/30 configurations. Furthermore, these do not require an optional red or yellow glass Energy Rejection Prefilter for operation as do our Hydrogen-Alpha filters. Colored glass works by rejecting all wavelengths below the cut point so a red 610 filter for example cuts at 610nm, wile a yellow 510 filter cuts everything below 510nm. So Calcium is not visible using a colored glass ERF. Rather, we recommend a dielectric "hot mirror" UV/IR cut filters, this will be installed just prior to focus. Note, these UV/IR cut filters are recommended for use with most production Catadioptric telescopes or other reflectors; these may accumulate so much heat at secondary mirror that their adhesive backing may loosen. While an 80 mm aperture telescope equipped with either filter can deliver <1 arc sec. resolution, and the spectral uniformity and image quality delivered at the eyepiece or imaging surface is truly remarkable, it is possible to employ even larger apertures. For use with larger aperture telescopes or for extended term dedicated applications we recommend an additional neutral density solar film; Company Seven offers some superbly crafted filters for these applications. This filter wheel was equipped with one 0.4Å Hydrogen Alpha QUANTUM PE, a 0.3Å Helium D3 QUANTUM PE, and a 5.0Å Calcium H-Line QUANTUM PE filters. This was the same set shown at the Prairie Skies star party, as then it had one vacant filter cavity. The DayStar Helium D3 professional grade filters are designed to reveal information about the Sun's prominences, plages, very fine granulations, and sunspot penumbral details by examining the light emitted by the reaction of Helium and Hydrogen interact. This line reveals fine details in super-granulation, and close examination can reveal flare footprint emissions. These filters transmit a strong absorption lines at 587.56 nm, known as the He D3 line, that is in fact a double line having a red fainter companion line yet the center between these two lines is at 587.60nm. So while these are in the deep blue region of the solar spectrum, first glance the Sun appears green with the appearance of major features much as on some of our better white light solar filters, but with fine surface details appearing notably brighter and more distinct than what you would observe through our Hydrogen Alpha filters. Right: DayStar Helium D3 Line Filter body with comparison images taken by it, white light, and 0.4Å Hydrogen Alpha QUANTUM PE filter (105,001 bytes bytes). We offer the choice of either 0.3Å He D3 QUANTUM PE filter or the 0.4Å He D3 QUANTUM PE filter, each with a 32mm clear aperture. The 0.3Å is a bit better suited to revealing disc features with higher contrast than the 0.4Å He D3. While the 0.4Å He D3 shows more of the prominences and is a bit brighter system allowing somewhat faster exposure times. These filter systems are designed for to be used with telescopes having f20 to f30 beams, and with an energy rejection pre filter, as mentioned above for our Hydrogen Alpha and Sodium filters. Being built upon the QUANTUM series housings, these can be controlled locally or remotely by the free DayStar Quantum Control software. These are among the more difficult filters to manufacture, hence their cost is proportional to that but this results in extremely high precision uniformity that is so critical for good results in the He D3 line. Also note that Company Seven prefers to work directly to instruct new customers, those lacking prior experience with our other DayStar filters, about how best to use these filters since obtaining the best results requires precise tuning. The DayStar Sodium D Line (also termed Na D) centered at 5895.9Å are professional grade filter assemblies with a single-cavity design made for sub-angstrom observations. The Sodium D Lines are very narrowly spaced, so a very narrow bandpass filter of less than 0.5Å is necessary to properly isolate the line from the continuum, so we offer 0.4Å assemblies. 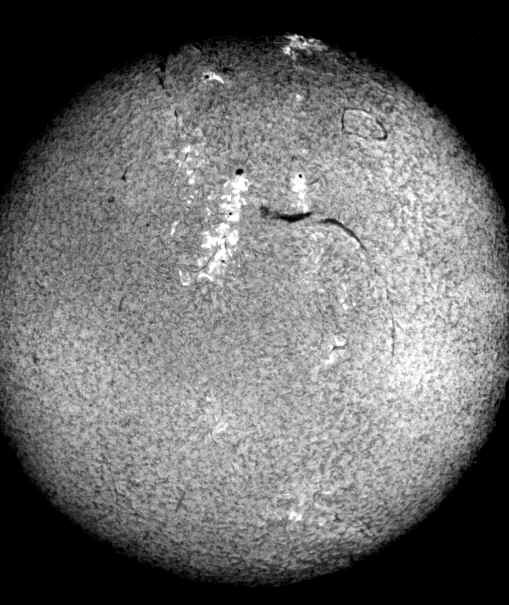 Sodium lines produce a very bright image well suited for either visual, photographic, or other instrumented studies of the Sun; the resulting image depicts high amounts of detail in granulation, supergranulation, and P-modes. Sodium also shows impulsive-phase flare eruption kernels. Right: DayStar Sodium D Line Filter body with transmission peak (45,315 bytes bytes). Sodium D is a low excitation line emitted when the low chromosphere is heated, usually at footpoints of flux loops passing through a flare, as sodium D line reflects the lower chromosphere. Visual and photographic images show the type of details much as do the Calcium K or H Lines, revealing granulation, but a Sodium D Line filter shows an image that is much brighter and more easily visible to the eye and to instrumentation than Calcium. Some observers characterize the image produced by Sodium D as similar to a white light filter but with notably superior contrast of photospheric details; and as with white light filters these cannot show prominences. The filter can operate unheated on the lower of the two Na D emission lines, or the filter elements can be heated to accomplish transmission on the higher of the two Na D lines. This technique makes doppler studies possible by imaging at each line and then deriving the difference in images by subtracting an average solar velocity image. This process is referred to as a dopplergram velocity image, and reveals the surface motions associated with supergranulation. The narrow bandpass Na D line filters have also been used in deep-sky observations, for example Na D is employed to study the volcanically active Io (the innermost moon of the planet Jupiter for those of you who never venture beyond the Sun). Io's surface appears dominated by evaporates composed of sodium salts and sulfur, but these are studied with significantly larger aperture telescopes. The Sodium D filters require an energy rejection pre-filter. Our standard yellow glass DayStar Energy rejection filters provide sufficient off-band energy rejection, as do dielectric 'hot mirror' coated pre-filters for some designs of telescopes. For nominal on band operation these are made to be employed with a telescope configured for an f/30 focal ratio. These are also among the more difficult filters to manufacture. Quality control during manufacture is critical, hence their cost is proportional. But this results in extremely high precision uniformity that is so critical for good results in the Na D line. Company Seven prefers to work directly to instruct new customers, those lacking prior experience with our other DayStar filters, about how best to employ these filters. Below we show details observed on the Sun as imaged by by Greg Swaim of DayStar Filters, LLC shooting though DayStar Sodium D Line filter. The core of the DayStar Double Peak Polarized Interference Filter is a solid space birefringent etalon. As a result, the completed filter exhibits orthogonal transmission modes (S and P polarizations). Filters can be fabricated as broad as 3.0Å or as narrow as 0.4Å. Peak positions are determined by the etalon thickness which can be fabricated with separations of 0.1Å to 20.0Å. All other etalon transmission peaks are eliminated by an appropriate square band blocking filter. The filter system is installed in a temperature regulated oven and one transmission mode is tuned on band while the other peak falls off band as the reference channel. A polarizing beam splitter selects the channel to be monitored. DayStar filters may be custom engineered for any application requiring the precise isolation of absorption or emission spectra from 3800Å to 1.1 microns. Depending upon wavelength, half-bandwidths from 0.4Å to 10Å are available with apertures as large as 47mm for example in Cyanogen-Corona lines, Calcium (8543Å), Helium, etc. Please contact Company Seven with your requirements, or visit our showroom to see these systems in operation. 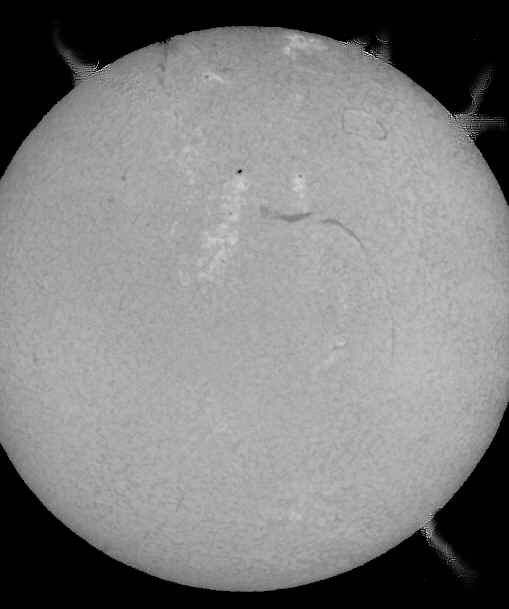 Each filter reveals a different aspect of the Sun, and with so many ways that DayStar lets you look at the Sun the idea came about to make a mechanism whereby the observer (or imager) could quickly change from one filter to another and thereby be better able to compare the same features at about the same time, but at several different bandpass settings. The result of this is the DayStar Filter™ Solar System Filter Wheel. 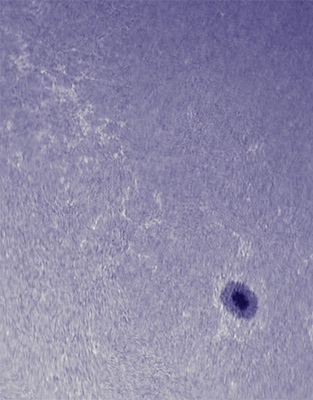 Right: The DayStar Solar Filter Wheel alongside a QUANTUM Hydrogen Alpha filter for comparison (53,015 bytes). Click on image to see enlarged view (120,741 bytes). Popups must be enabled. The DayStar Solar Filter Wheel allows you to view or image the Sun through as few as two or up to four different installed filters selecting any one with just the touch of a button* or even by remote control*. Each filter still has full +/- 1Å wing shift tuning capability, and the renowned Quantum precision control. So this is fully satisfactory even for the most demanding research applications. * Any DayStar Hydrogen Alpha, Helium D3 Line, or Sodium D Line filter must be employed in conjunction with a suitable optional energy rejection filter. The DayStar Solar Filter Wheel is great for outreach and education events since the behaviors of several different elements and how they appear as features on the Sun can be quickly compared. With several DayStar filters installed you can perform INSTANT COMPARISONS of solar phenomena: switch within a few seconds from Hydrogen Alpha to Sodium, then to Helium and on to Calcium and back again, effortlessly and accurately employing just one telescope. This can be particularly stunning when employed at public outreach and education activities since the behaviors of several different elements and their how they appear as features on the Sun can be quickly compared. Realize savings of funding by not having to purchase a second, third or fourth solar telescope and mount. Efficiency of time: whether you are limited by the time allowed in a class session or when competing for time on a research instrument. The Filter Wheel minimizes time that would otherwise be lost reconfiguring a telescope. The quicker set up and take down times add up to big advantages and savings of something much more costly over the years than hardware: time taken up by staff that would otherwise be changing filters and telescope configurations one at a time. The filter wheel even saves on training time for new staff and reduces the risks of lost components or confused operators; the assembly simplifies operation of multiple filters and is just about as "idiot proof" as is possible. Any of the DayStar filter wavelengths, bandpasses, or quality combinations can be used. We can even load custom wavelengths for your research applications. Click on the hyperlink to learn more about the DayStar Solar Filter Wheel.